If you live in Sydney, or just happen to be in town, make sure you stop by our showroom at 168 Best Rd in Seven Hills. Previously, Kizlyar was limited to online images and info as well as stockists sparsely located around Australia, giving you the chance to see a small selection of what we fully have to offer. With our show room now up and running, we are inviting members of the public to come in and check out for themselves some of the great products we have to offer. Check out our vast range of Knives from over 20 different brands and feel free to ask one of our helpful staff if your have and questions regarding our products. If your are interested in becoming a stockist of one of our brands please call 1300 83 99 66 and we can arrange a meeting. With 2013 well and truly underway, Kizlyar have jumped on the Social networking wagon to make sure all of our friends and fans can be kept up to date with our most current activities. Our new facebook fan page will set the scene for product promotions, competitions and latest news for all our shows and exhibitions. We have also begun a series of Kizlyar Tv videos through our YouTube channel, helping our customers get a better idea and perspective of our products, where you can ask questions or leave feedback regarding your Kizlyar products. We have also got a Twitter account which you can follow along with all our other pages on the links below or the floating sidebar on the website. 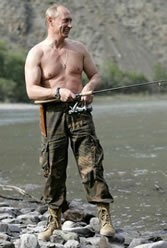 Bare-chested Putin Goes Fishing & Carries Kizlyar’s Knife on His Belt. 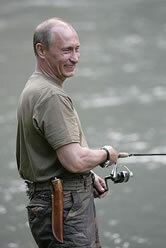 In August Russian President Vladimir Putin takes Monaco’s Prince Albert II on a fishing trip to Siberia, where he strips to the waist. Photographs from the trip made headlines around the world showing the Russian President answering the call of the wild. Hanging on his belt Mr. Putin has a knife created by Kizlyar’s Saint-Petersburg branch specializing in high-end quality knives, which has recently been given a new name, the Nord Crown. Putin has a very good taste for knives. Kizlyar’s knives have received a large number of awards, including Best Art Knife at the German IWA show. However, the most important award for us is this. It is a great pleasure to see that our knives reached that level when the highest man in the country, President Putin himself, gives our knives to his quests in Kremlin as well as takes pleasure using them himself. Putin is carrying knife Kuniza. The blade is of beautiful Damascus steel and the handle is of Karelian birch. The knife is produced by highly experienced masters and can be decorated with silver, gold, different stones and other materials. Please visit the web-site of Kizlyar’s Saint-Petersburg branch the Nord-Crown at www.nord-crown.ru.